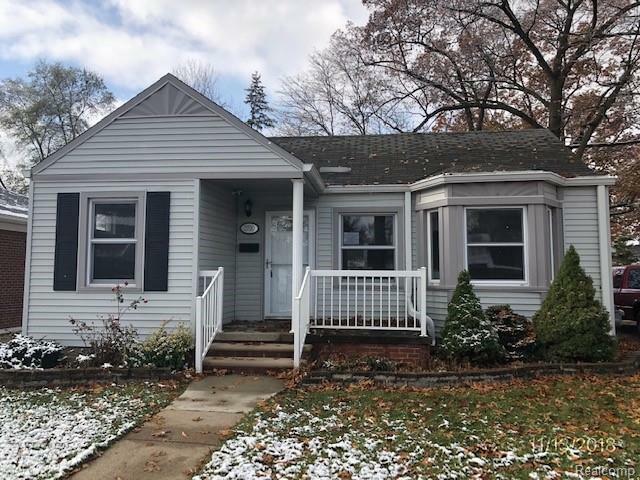 This home is eligible for the Freddie Mac First Look Initiative for OWNER OCCUPANT BUYERS ONLY FROM 12/5/18 through 12/26/18, after this period expires, Investors are welcome. This 1 bedroom 1 bath ranch has great outdoor space for entertaining and gatherings. Property has been converted to a 1 bedroom with wood flooring throughout, newer light fixtures. Home needs a little TLC, but its priced right to sell quickly. Make this your home for the holidays. IDX provided courtesy of Realcomp II Ltd., via Maxim Properties Llc and Realcomp, ©2019 Realcomp II Ltd. Shareholders. Copyright 2019 Realcomp II Ltd. Shareholders. Real estate listings held by brokerages other than GK Real Estate Team | Real Estate One are marked with the Realcomp-approved IDX logo and are provided through IDX through Realcomp II Ltd. IDX information is provided exclusively for the consumers' personal, non-commercial use and may not be used for any purpose other than to identify prospective properties consumers may be interested in purchasing. Any use of search facilities of data on the site, other than by a consumer looking to purchase real estate, is prohibited. The accuracy of all information, regardless of source, is not guaranteed or warranted. All information should be independently verified. Data last updated: 2019-04-21T23:57:57.147.